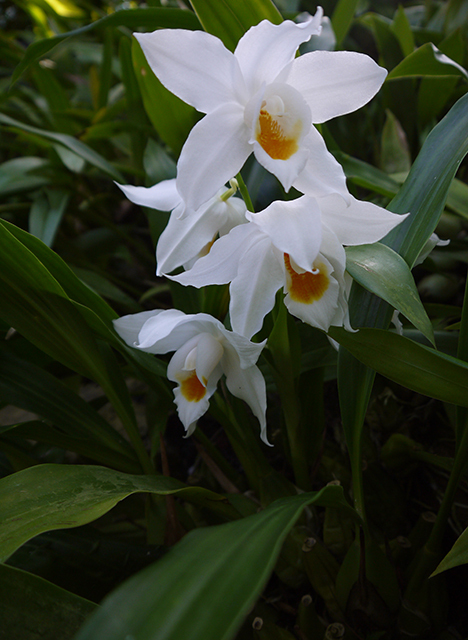 Ravishing in the early morning light, Coelogyne (pronounced see-LOJ-in-ee) mooreana, photographed in the Tropical High Elevation House. This large-flowered orchid species is easily grown under cool tropical conditions and flowers several times each year for us. A really choice plant. Most Coelogynes are epiphytes, i.e., they grow in trees, but ours do just fine planted in the ground in the very porous soil of the Tropical High Elevation House. C. mooreana is endemic to Vietnam where it grows at 1300 to 2,000 meters in montane cloud forests.